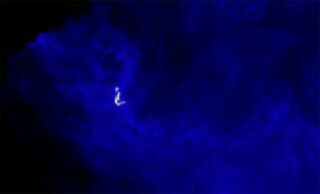 A large-scale image by the Herschel telescope shows the dust of the Perseus star-forming region (in blue). The red and green regions are dense areas where scientists say they have identified one star and three soon-to-be stars that belong to the same family. For the first time, a litter of four infant star siblings have been seen gestating in the belly of a gas cloud. Researchers say the finding supports the theory that most stars do not begin their lives alone. In the Perseus star-forming region, four stars are emerging from a single parent filament, and have been observed moving together as a family. Three of the siblings are balls of gas (within the larger gas filament) that researchers say are on the cusp of collapsing into stars, while the fourth sibling has already become a star. The newly discovered star babies appear to be less than 100,000 years old, and may be the "youngest multiple star system," ever observed, according to Kaitlin M. Kratter, an assistant professor astronomy at the University of Arizona, who was not affiliated with the new research. A close-up of the region where a family of infant star quadruplets are forming. The new research shows that these four stars are forming from the same gas filament, and are linked together in a single system. But the stars (or soon-to-be-stars) are separated by 3 to 4 thousand astronomical units or AU (the distance from the Earth to the sun), which the authors of the new work say is a very large distance for star binaries. Normally, star twins are separated by only 10 to 1 hundred AU. "These objects are so far apart that previously we all thought they were unrelated," said Jaime Pineda, a researcher at the Max Planck Institute of Theoretical physics and lead author on the new research. "But with the new observations, we can measure that these systems are really part of a whole. In this case it's the first time we can say it's like a family." The researchers used three different telescopes to study the stellar babes. To show that the stars are part of the same family, the researchers had to measure their velocity, and show that they were moving as a unit. "If you don't know at what velocity the gas is moving you can't make this kind of study about the level of bound-ness of the system," said Pineda, who completed the research at the University of Zurich. More than half of the stars in the universe are thought to exist in multi-star systems. It is through observing the motion of binary stars that scientists have identified black holes that have masses close to that of our sun. Binary stars can create Type Ia supernova, which scientists use to measure distances in the universe. Binary star collisions may create gravitational waves, or ripples in the fabric of space-time. Scientists have found potentially habitable planets around binary star suns. "And yet the origins of the all-too-normal population are mysterious," said Kratter, in an article in the journal Nature discussing the new research. Binary systems are highly common, but full-grown quadruple star systems are much rarer. An artist's impression of the quadruplets. The left panel shows the star and three dense gas balls. Right panel shows the system after all four star siblings are born. "Given the relative rarity of quadruple star systems at older ages, one might think this discovery improbable, or lucky," Kratter said. "On the contrary, it supports predictions that most stars begin their lives in a litter." It's likely that after multi-star systems form, a kind of sibling rivalry sets in: the gravitational pull of all the bodies creates a highly unstable environment. While the researchers cannot say for sure what will happen to the four star siblings, Pineda said it's likely at least one of them will be ejected later on. Kratter also notes that young stars have more bound companions than older stars, indicating that while stars may be born in groups, they eventually move away from home, leaving behind a smaller pool of siblings. Some double-star systems may contain stars that were born together, while ejected stars may form binaries somewhere else. The new result is a tantalizing piece of evidence that could help astronomers understand how star families form. Based on the new finding, Pineda said, researchers may want to re-examine other groups of stars that were previously assumed to be part of separate systems, to see if they are, in fact, part of the same family. "I think it's very likely that […] there are regions where we can repeat this experiment and try to determine […] in a more general way if this is a common result," Pineda said, "Or if we're looking at an odd ball." The research is detailed online in the Feb. 11 edition of the journal Nature.